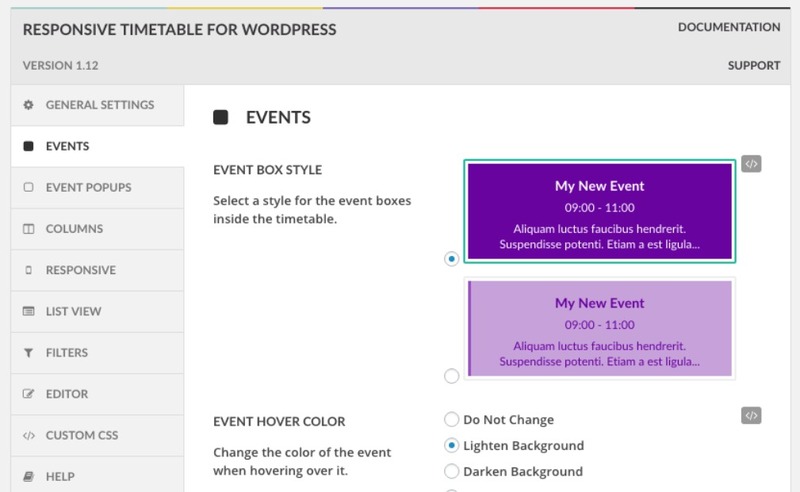 Why Would You Need a WordPress Event Calendar Plugin? WordPress event calendars are such plugins that are designed to make things easier for you when you have to update and inform your viewers about your upcoming events. A WordPress calendar plugin allows you to showcase the relevant information of your specific event in one place neatly on your website. Some come fully function-packed being WooCommerce ready as well as other ingenious features. You can display one or multiple WordPress calendars to your preference. WordPress offers you with a large range of Calendar plugins that you can easily choose and use for your sites. With such a wide range, it is obviously a hassle for you to choose the best one for you. Understanding your needs and keeping in mind your precious time and effort, we have made a collection of best WordPress Calendar plugin just for you! Go ahead and find the one that works perfectly for you! While in search for the best WordPress Events Calendar, we came across the ingenious The Events Calendar. This is the plugin that is perfect for those of you who wish for ease of access and professional-level features. This calendar plugin comes with various useful features including its extension ability, easy to use as well as recurring events, ticket sales as well as integration with Facebook and other social medias. Easy to customize this WordPress calendar is built and audited the WordPress way. With this, you can create events in a rapid way as well as save the venues and organizers. You can view your events in a day, week or month view. This plugin being international and translation ready makes it the perfect WordPress calendar plugin for you to manage your events. Also, you can increase your SEO with the available Microformats. Not to mention that this plugin is tested on all the major theme frameworks like Avada and Woo Themes to improve the functionality of the plugin. Easy to download and install, here is a glimpse of what you will get once you download it. You not only have the option to customize the time and date, but you can also add the location as well. This is the customizer that appears on the bottom of your new event page. Moreover, being adaptable with WooCommerce, you can even add the cost to either book or buy the tickets to your event directly from your site. If you want, you also have the option to add the name and addresses of your organizers and sponsors. Recurring events with a range of viewing mode. Adaptable to WooCommerce, Shopp, and WP E-Commerce. Community Event function that lets you add events directly to the calendar. Extensive templates meant for Tags and Customization. One of the most versatile and effective WordPress Calendar Plugin, Event Schedule is the ultimate schedule tool which will make your work ten times easier. How? This simple and versatile widget has the elegant display that has five different style and designs of time tables. Being fully responsive, this WordPress calendar is also mobile friendly. Perfect for official schedules at offices and schools/colleges you can also use this for any other events. Because this is WooCommerce friendly, you can even use this to book or sell the tickets to your upcoming event right from your site. No extra plugins required. Not only this, but this plugin comes with an in built Visual Schedule Builder to help you organize your schedule. Easy t use, you can use or set it up in minutes. What’s more is that this plugin is compatible with almost all themes in the Theme Forest. Not only with themes, but this WordPress calendar plugin is also compatible with other popular plugins. With a beautiful and unique landing page, here is how your events look when you set it up. Amazing isn’t it? You have different options where you can customize everything including the position, colour and that too with great resolution. In addition to its amazing looks, you can see an example of how easy it is to customize the whole plugin. You can add or remove multiple events to display on the same page. Moreover, you can manage your whole event like it’s piece of cake. Translation is ready and fully localized. MotoPress Timetable and Event Schedule is a completely free WordPress plugin which comes with a responsive design and an all-around customization toolkit. The plugin is used by thousands of people and is highly rated on the official repository. You can use for timetabling different types of events like lessons, gym classes, conferences, fests, case-studies, concerts, and more. Basically, you are able to create a clean-looking calendar of your events and feature upcoming events in an individual widget. The plugin comes with a shortcode generator making it extremely simple for non-tech WordPress users to set it up and customize. 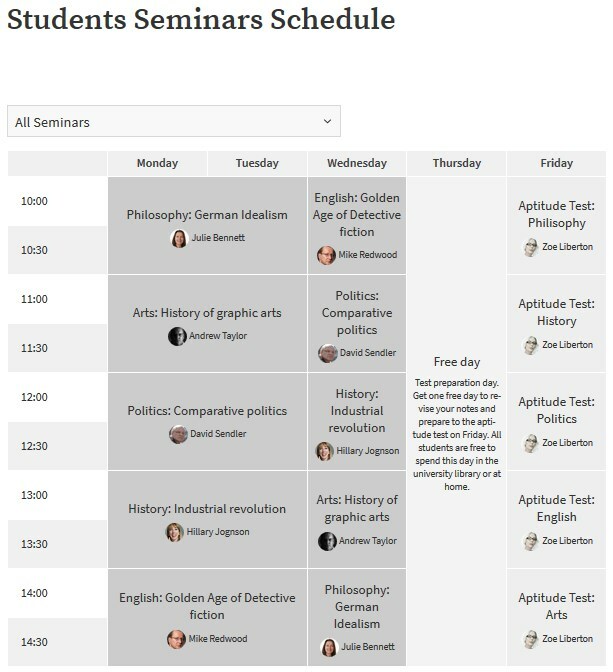 Working with the plugin settings, you’ll be able to create and label any number of columns (be it days of the week or dates), display all needed events with their categories, set a needed time frame, display all needed extra info like time, even head, subtitle, etc. You can also apply different colors to specific events and make your events calendar more attractive and well-balanced. 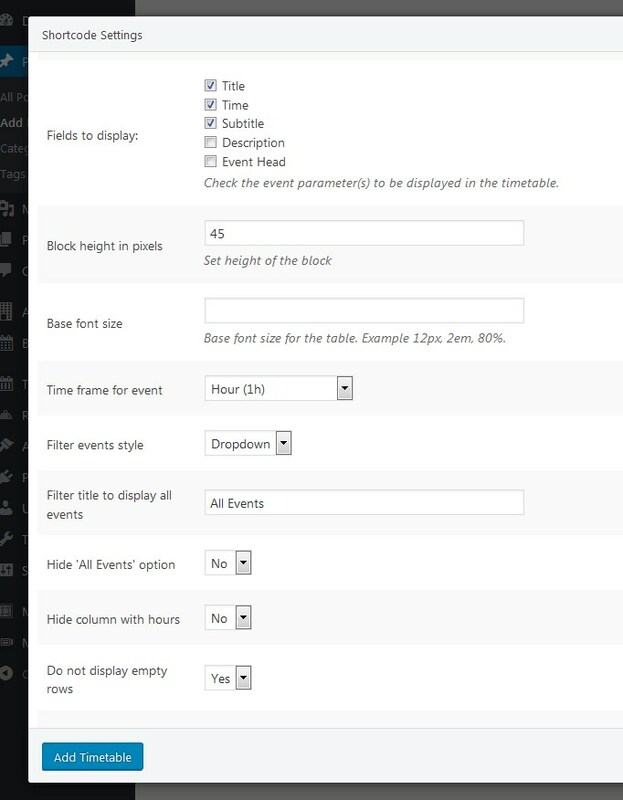 The plugin settings let you apply a stylish list view of your events on mobile devices. Color settings for background, background hover, text, and text hover. Clean and modern interface, this WordPress calendar is a fully responsive and function rich calendar plugin. With elegant and eye-pleasing design, this WordPress calendar is perfect to showcase your events whether one or multiple. This plugin features the functions like- Event pop-up, image or YouTube video as well as options to create advanced filters. With this, you may choose from 3 different type and design of timetables to create your event. You can even add custom fields with your events with links to make reservations and show prices. Additionally, the main feature is its capability to show four events simultaneously in the same column. The built-in Live editor is one of the appealing features that ease the process of scheduling and creating your events. Not to mention the feature of Custom fields, Event Editor, as well as Time Slots that the plugin offers you make organizing your events a piece of cake. As for the installation, it is so easy to do it. Using its brilliant customization features is even easier. You can add as many events as you wish and edit it to your liking. You can choose your own custom colour and style to match your template. Another awesome feature is its custom event pop up that garners more views on your site and event. With this plugin, you will be able to make customize the event pop-up as well however you like. Timetable Shortcode Generator and Widget. Option to download the event as PDF document. Multiple time slots that are easy to manage. Easily customizable background color and image. Simultaneous side-by-side display of event. The easiest and efficient WordPress Calendar plugin that you can find, Google Calendar is an app that is so easy to set up. Presented by the official Google, this calendar is simple and fine tunes your requirement for easy usage. The clean and elegant design steals the look right away. Also, the design is fully responsive as well as mobile friendly. Talking about efficiency, with this WordPress plugin you do not need to update your WordPress calendar. Instead, you can just keep creating events on your Google calendar on your phone, and it automatically updates itself. You can view your events in a day or week view. You even may highlight the events and colour coordinate them. Also, this WordPress plugin also integrates with other plugins like Event Calendar Newsletter for the option to send your events. 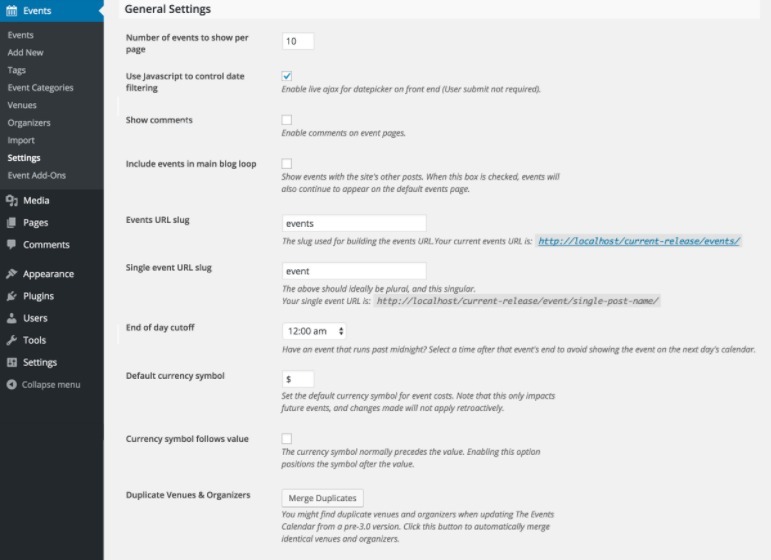 The simple aspect of this WordPress Calendar widget also applies to the settings that the plugin provides for us to make any changes to the events. Minimal and simplistic, you can set the event from your phone app as well. But if you prefer managing events from your computer itself then, this is also not a problem. You can even customise the appearance of how the event box will look on your site with the simple and easy-to-understand menu. You can add the dates and location as well as highlight the important parts as well. Display event from either private or public Google Calendar. Fully-responsive and mobile friendly design. Translation ready with more added on a regular basis. Easy to use and categorize with the option to combine calendars. Easily display all the information of the event including the attendee names and avatars. Compatible with almost all the themes available. 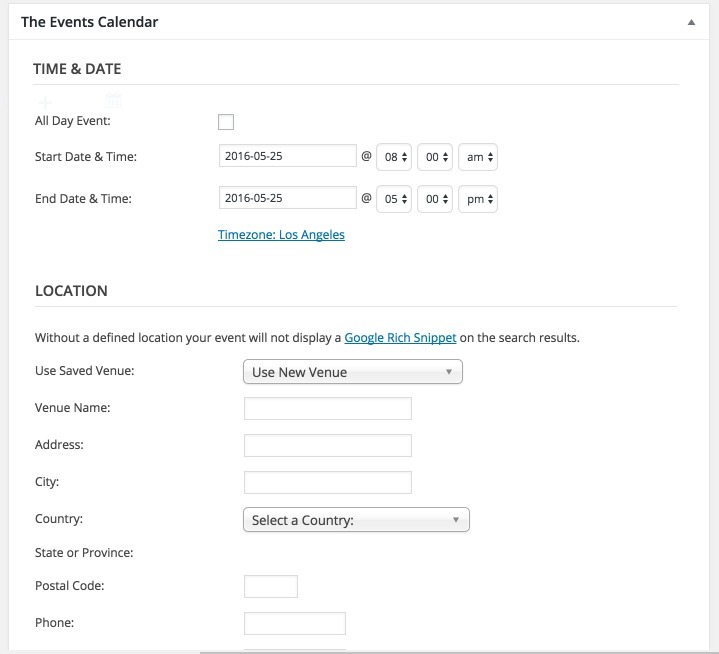 Event Calendar is another example of an effective and ingenious function filled WordPress Calendar plugin. Why? Because whatever you are searching for comes along with this plugin. Whether you want to display recurring or unlimited events, it is up to you. The elegant display offers you with five different customizable themes that you can work with. To top that, the plugin also offers three premium views as well as 14 different add-ons on the premium version. With this particular plugin, you can select the ordering of the calendar view. Additionally, the design is fully responsive as well as mobile-friendly. To top it all, this plugin is integrated with Google Maps so that you can easily include the location of your event venue. You also have the option to share your events using the social sharing buttons included in the plugin. 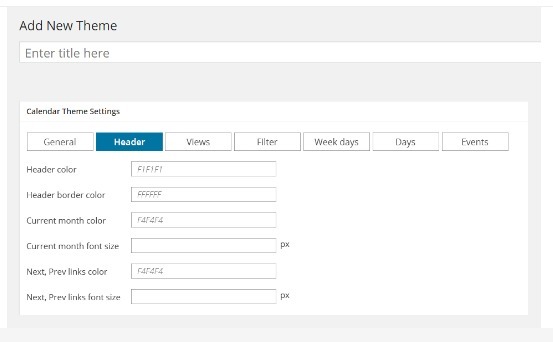 The most remarkable feature of this plugin is that you can customize the theme for this plugin to match with your template. You can customize the header, as well as the views and the filter it uses. In addition, since this is synchronized well with google maps, you can even add the location and venues to your event directly on your page. Supports single-day event as well as long events on multiple days. An unlimited number of calendar and events. A comprehensive and easy to use solution for event management, Event Organizer is one of the best WordPress calendar plugins that you can find. It features the complex event recurring schedules as well as the multi-day-event. You can easily add or remove dates on your event as you like. 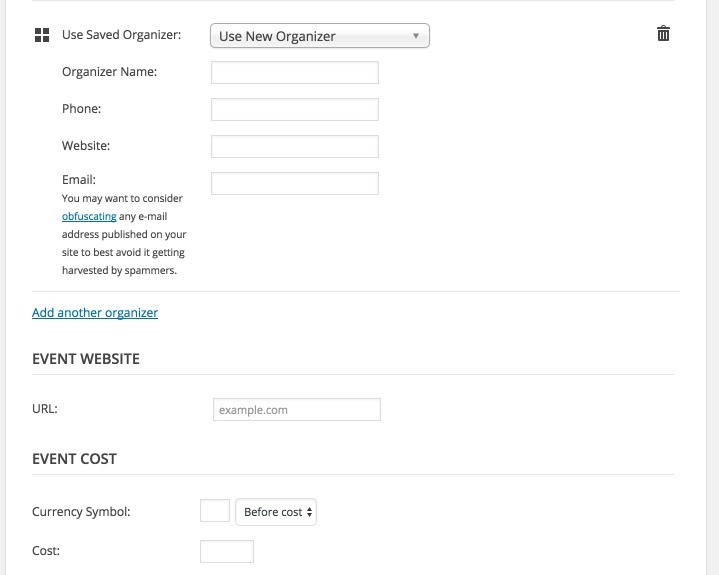 If you are looking to sell you tickets to your events, you can do that with ease with the customizable booking forms. You can collect the Payment however you like whether with Stripe, iDeal, Pro-Offline or even Paypal. Although it is user-friendly, this plugin was designed especially with developers in mind. This means that if you want, you can easily change the templates and modify the plugin as a whole. You can see how organized and easy event managing can be with this WordPress event calendar plugin. Easy to install and use, this certainly made it on our list of best WordPress Calendar plugin. 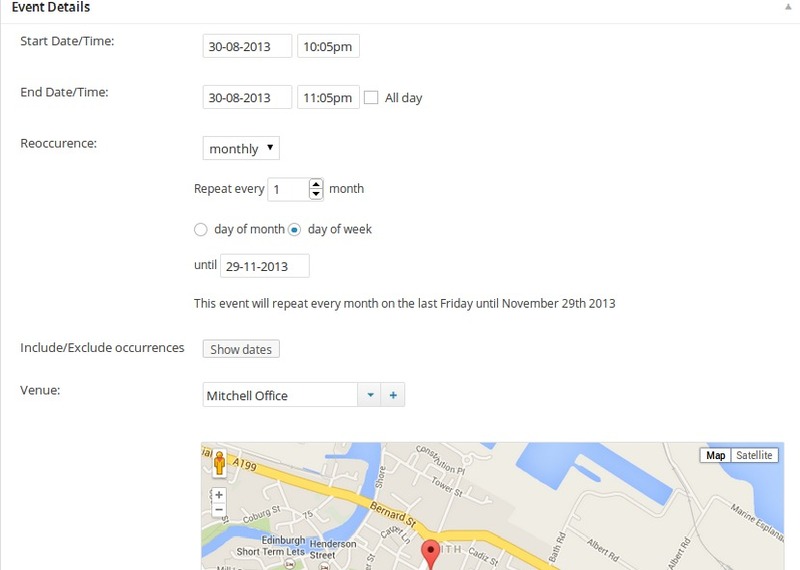 With your events, you can easily add details of its date, time as well as add the venues. If it is a recurring event, you can add those details as well. Easily create one time or recurring events, adding or removing dates. Going through the large range of free and premium plugins, you may have confusions to choose the best one. Whatever you need in your plugins, you can find it with our list of hand-picked list of Best WordPress plugins.With these, not only will you be able to create events in a breeze, but you will also be able to customize them to match your website. So take your pick and choose the best one for you! If you are looking for something else than Event Calendar plugins, why not check out our other collections of plugins to help you out! I keep following your posts. it’s really good. You save a lot of my time and effort. As you mentioned all these plugins have their own features. But these are the must plugins for any WordPress website.